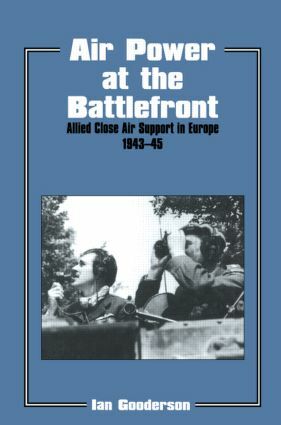 Ian Gooderson presents a study of close air support in World War II, with the analysis focusing on the use of tactical air power by British and American forces during the campaigns in Italy and northwestern Europe between 1943 and 1945. CHOICE -"This is a useful but narrowly cast work because Gooderson does not really analyze the relative effectiveness of the strategic air offensive at this late stage in the war"
Canadian Military History- "marks the first serious attempt in book form to both analyze and quantify the effects and effectiveness of allied close air support in western Europe during the Second World War…highly recommended for its plethora of statistics and extensive use of primary documents"
The International History Review-"Having dug through an impressive list of sources including contemporary ooperational researches (US analyses), Gooderson is able to marshall evidence effectively to make his points." "This is an excellent work … This book is an essential read for air power and Second World War scholars, and also to anyone interested in today"s joint service environment. This series examines both historical and contemporary aspects of air power, focusing on human issues as well as the technical developments.